The North American elk is one of the continent’s largest and most majestic mammals. Each fall, bowhunters in search of adventure, lean wild meat and an antlered trophy are attracted to the mountainous regions of the Western United States to pursue elk. Let’s take a closer look at the fascinating world of the North American elk and find out why these creatures attract such a following. Before European settlement, an estimated 10 million elk roamed what is now the continental U.S., much of Canada and parts of Mexico. Westward expansion drove elk from their native ranges to the rugged safe havens of the Rocky Mountain states. This forced relocation significantly impacted the North American elk herd and depleted the total population to an estimated 50,000 animals at the turn of the century. Unfortunately, during this process two of the original six subspecies were driven to extinction: the Merriam’s elk from the American Southwest and Mexico, and the Eastern elk that inhabited areas east of the Mississippi River. The four remaining subspecies, the Rocky Mountain elk, the Tule elk, the Roosevelt elk and the Manitoban elk, survived the progressive agendas of the 19th century, thanks to the North American Conservation Model, which was established by hunters and conservationists, including Teddy Roosevelt. Thanks to the tireless efforts of groups like the Rocky Mountain Elk Foundation, the North American elk population is now estimated to include over one million animals. Since its inception in 1984, the RMEF has helped conserve and enhance over 7 million acres of elk habitat and reintroduced elk to parts of the country where they previously thrived. Relatively small herds can be found in Wisconsin, North Carolina, Tennessee, Pennsylvania, Michigan, Virginia and Kentucky. The bluegrass state is home to the largest Eastern population of elk at over 10,000 animals. These Eastern herds were established – with the help of the RMEF – by relocating elk from several Western states. In recent years a few of these Eastern states have started using controlled hunting as a management tool. Due to this practice, license numbers are extremely limited and the odds of drawing a tag are low, but elk hunting is once again possible. Elk are remarkable animals. They are one of North America’s largest game animals. Males — called bulls — typically weigh between 400 and 700 pounds, but can grow to 1,000 pounds, while females —known as cows — weigh between 300 and 600 pounds. For most of the year, bulls live in small groups identified as bachelor groups while cows, calves, and yearling bulls (spikes) live in herds. Bulls develop massive antlers that extend over four feet from their head and span just as far apart. A fully mature bull rack weighs as much as 40 pounds. Bulls lose their antlers each winter and grow a new set each spring, just like the white-tailed deer. Cows generally give birth to one offspring — known as a calf — each year during late May or early June. Elk graze on grass year round. They seek out alpine meadows found at higher elevations during the spring and summer months, and locate valleys and open areas during the late fall and winter when extreme weather is less of a factor. Elk have two top canine teeth called ivories. These ivory teeth are believed to be the remnants of saber-like tusks their ancestors used in combat. Elk ivories are considered a prized possession, and are often kept as a memento among most hunters in the states. The breeding season — known as the rut — typically takes place in September. These creatures are very vocal, especially during the breeding season. Cows call to alert bulls of their presence. Bulls bugle to notify other elk of their intention to breed. The bugle is a high-pitched scream followed by a series of grunts and bellows. Bowhunters often mimic these vocal communications in a process known as calling. When a hunter uses this tactic, bulls often come in close to investigate. The situation often produces a unique hunting experience. 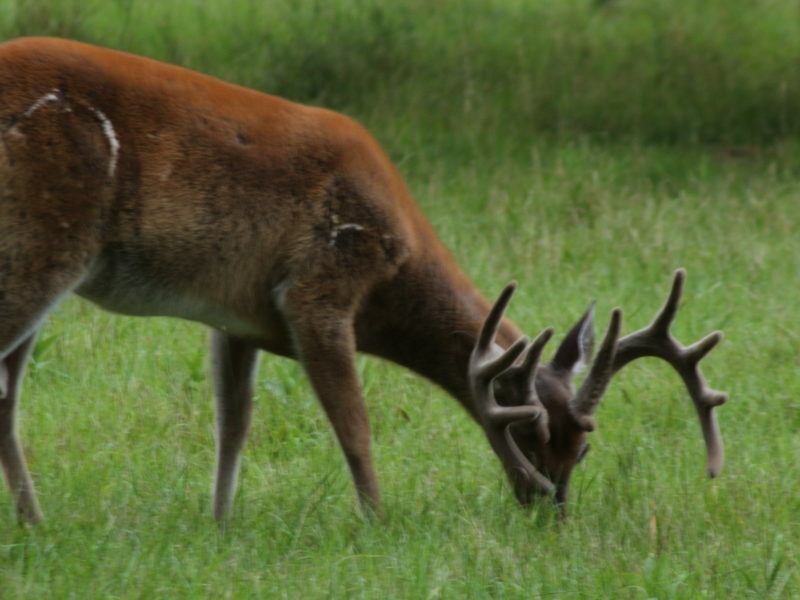 In addition to an elevated amount of vocal communication, the rut also leads to behavioral changes for both bulls and cows. For instance, bulls urinate and wallow in the area to coat their bodies in the scent. This scented mud bath is another way to attract a suitable mate and establish dominance. Once they attract several cows, bulls gather them and their calves into a group, known as a harem. They use their antlers to battle other bulls, and guard and defend their harem. Most elk hunting seasons in the U.S. begin in August and last into the New Year. Hunters typically prefer to be afield in pursuit of elk during their breeding season. Luckily for bowhunters the timing of the rut usually aligns with most archery seasons. Hunt with a bow and your chances for an elk encounter are elevated. Archery elk hunts are conducted using a stand or blind. However, this method is less common than the spot-and-stalk style preferred among most bowhunters in pursuit of elk. It’s common to hike several miles of countryside every day while bowhunting elk. A comfortable pair of boots and a good layering system are atop the gear list, as well as an accurate bow and razor-sharp broadheads. Thanks to the continued efforts of organizations like the RMEF, it’s still possible to see and hunt an elk in its natural environment. If you’re fortunate enough to live in a place elk call home, you’ll likely understand why they’re one of North America’s most interesting game animals. And, if you don’t live in elk country, it’s time to see for yourself why elk are such amazing animals. Visit your local archery shop to get expert advice on gear and tips to prepare for an archery elk hunt. Bowfishing: When One Season Ends, Another Begins!